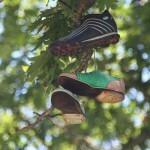 Firstly, invest in a good shoe tree. Don’t be tempted by the shiny varnished versions. They might look great, but only an unvarnished wood (ideally cedar) will draw out all the moisture from your shoes, helping them contract and dry out to their ideal shape. 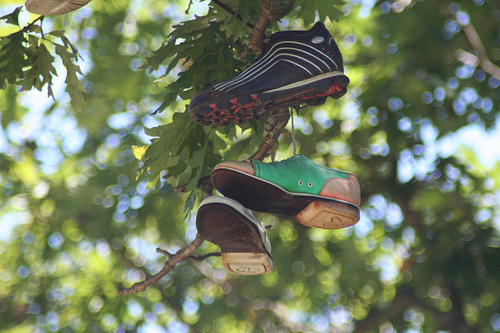 Try to keep your shoes on the shoe tree for the first couple of hours after you take them off your feet – that’s really all the time your shoes need to return to their natural shape. The best shoe trees have a split toe and a fully shaped heel to ensure a really close fit between shoe and tree – highly recommended. Using an unvarnished cedar shoe tree can also help prevent smelly shoes, as it absorbs the moisture from the shoe. But if you’re still having odour issues, try replacing the insoles. If your shoes get really wet, stuff them with newspaper, and avoid the temptation to put them near a direct heat source. 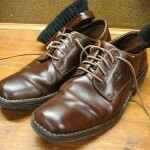 Heating too quickly can cause the leather to crack, which can permanently damage your shoes.